Buy any Halls Grenhouse over £300 and get a FREE 4ft WOODEN STAGING worth £45 - just add a 4ft Wooden Staging to your basket, and use Promo Code STAGING at the checkout. This Halls Magnum 108 greenhouse is relatively simple to construct using the comprehensive instructions which have excellent illustrations. Fast UK customer support is available should you have any problems. This greenhouse is supplied as a self-assembly product. All heights include the optional 5" Galvanised Steel Base. If you choose not to have this base, you will need to supply a raised strip of timber, metal or brick beneath the aluminium framework, to accomodate the lips of the lowest profiles. Glazing - Horticultural Glass is the standard glazing material used for glazing greenhouses, although many customers now choose to have Long Pane Toughened Glass which is about 8x stronger, and comes in large panes so there are no overlaps (this also looks nicer). Toughened Glass is very strong and shatters into tiny fragments rather than dangerous shards like Horticultural Glass. 6mm Twinwall Polycarbonate is a UV-stable, almost unbreakable glazing which has internal cavities, so it is not as transparent as glass. 6mm thick sheet is 50% stiffer than the 4mm normally used, so is much more wind-resistant. 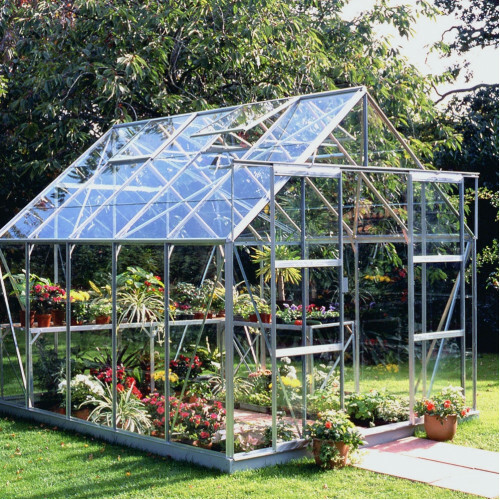 The Halls Magnum 108 greenhouse is available in plain silver framework or in a green powdercoated finish, which is baked on.